Applebee, A. N. (2013). 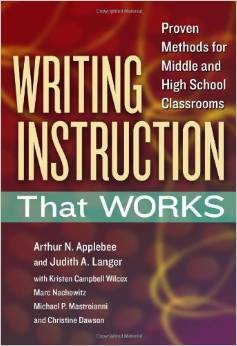 Writing Instruction That Works: Proven Methods for Middle and High School Classrooms. New York : Teachers College, Columbia University. Backed by solid research, Writing Instruction That Works answers the following question: What is writing instruction today and what can it be tomorrow? This up-to-date, comprehensive book identifies areas of concern for the ways that writing is being taught in today’s secondary schools. The authors offer far-reaching direction for improving writing instruction that assist both student literacy and subject learning. They provide many examples of successful writing practices in each of the four core academic subjects (English, mathematics, science, and social studies/history), along with guidance for meeting the Common Core standards. Gallagher, K. (2011). 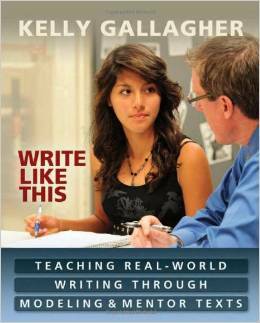 Write Like This: Teaching Real-World Writing Through Modeling and Mentor Texts. Portland, ME: Stenhouse Publishers. In Write Like This, Kelly emphasizes real-world writing purposes, the kind of writing he wants his students to be doing twenty years from now. Each chapter focuses on a specific discourse: express and reflect, inform and explain, evaluate and judge, inquire and explore, analyze and interpret, and take a stand/propose a solution. In teaching these lessons, Kelly provides mentor texts (professional samples as well as models he has written in front of his students), student writing samples, and numerous assignments and strategies proven to elevate student writing. Kittle, P. (2012). 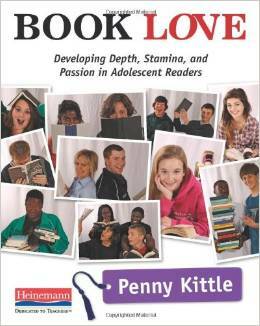 Book Love: Developing Depth, Stamina, and Passion in Adolescent Readers. Portsmouth, NH: Heinemann. In Book Love Penny takes student apathy head on, first by recognizing why students don’t read and then showing us that when we give kids books that are right for them, along with time to read and regular response to their thinking, we can create a pathway to satisfying reading that leads to more challenging literature and ultimately, a love of reading. Kittle. P. (2008). Write Beside Them: Risk, Voice, and Clarity in High School Writing. Portsmouth, NH : Heinemann. What makes the single biggest difference to student writers? When the invisible machinery of your writing processes is made visible to them. Write Beside Them shows you how to do it. 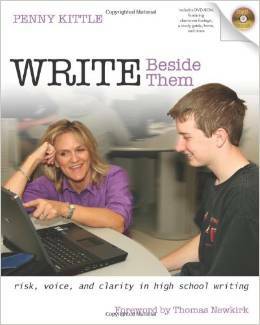 It’s the comprehensive book and DVD that English/language arts teachers need to ensure that teens improve their writing. Across genres, Penny Kittle presents a flexible framework for instruction, the theory and experience to back it up, and detailed teaching information to help you implement it right away. Each section of Write Beside Them describes a specific element of Kittle’s workshop. Lewis, J. (2009). 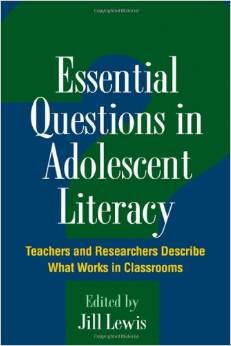 Essential Questions in Adolescent Literacy: Teachers and Researchers Describe What Works in Classrooms. (Edited by Jill Lewis ; foreword by Elizabeth Birr Moje). New York: Guilford Press. In each chapter of this unique volume, an exemplary teacher collaborates with a prominent scholar to present real-world strategies for putting literacy research to work in grades 5–12. These lively dialogues tackle key questions in adolescent literacy, including issues of motivation, critical thinking skills, content-area writing, differentiated instruction, assessment, English language learning, and technology. Suggestions for incorporating adolescents’ out-of-school literacies and working with reading specialists and coaches show how to build connections between the classroom and wider communities. In-depth portraits of challenges and successes in the classroom, practical instructional tips, and stimulating questions for reflection make the book a valuable resource for inservice and preservice teachers.